There is a lot to be said for marketing and the cunning choice of words. Because anything with the word “über” in it made my ears prick up. It just sounds so much fun. Eating something über has to make you super-duper. Or that might just be me. The über-food I am referring to is the über-wrap served up by French & Grace, a tiny café in Brixton village, founded by food bloggers Rosie French and Ellie Grace. And no, despite the über in the title, they’re not serving up giant bratwurst in wraps. There’s German food in sight – expect modern Middle Eastern and Mediterranean fair and a whole lot of taste. I actually first heard of French & Grace when I spied them at Feast, but sadly didn’t have room left in my stomach. However, I soon ventured to Brixton and squeezed onto a cushioned bench at one of the three tables in the café. I confess that I was so preoccupied with the über-wrap that I didn’t pay too much attention to the rest of the menu but you can see a sample here. It’s crammed full of tantalisingly delicious-sounding mezzes. 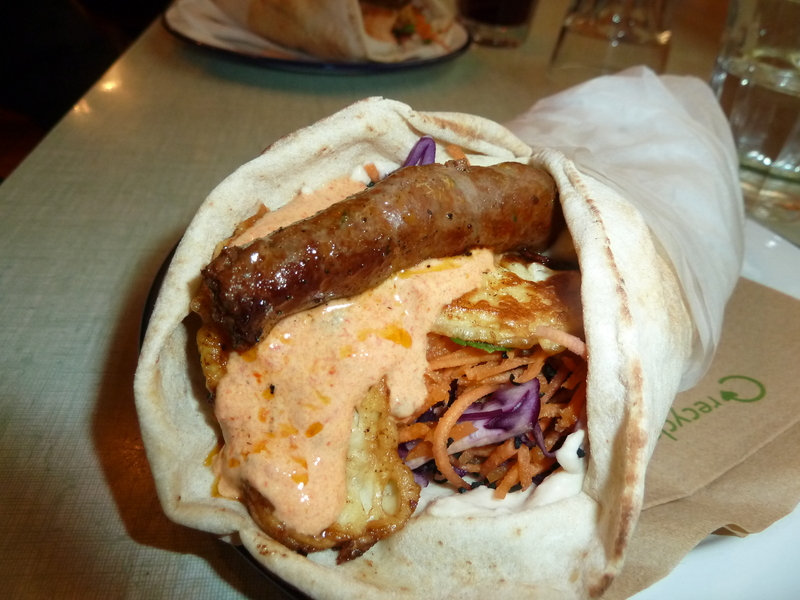 As for the über-wrap (£6.60), it involves a warm Lebanese flatbread filled with lamb merguez (a fantastic mildly spicy sausage), halloumi, butterbean and rosemary hummus, harissa yoghurt, and carrot and red cabbage slaw. I was worried that too many flavours would be competing with one another and that some would over-power the others. Not a bit of it – the über-wrap is a smooth taste-sensation. For dessert, I ordered affogato (£4.20), which was a tad disappointing – the ice-cream and coffee were average and the almonds contributed no flavour at all. 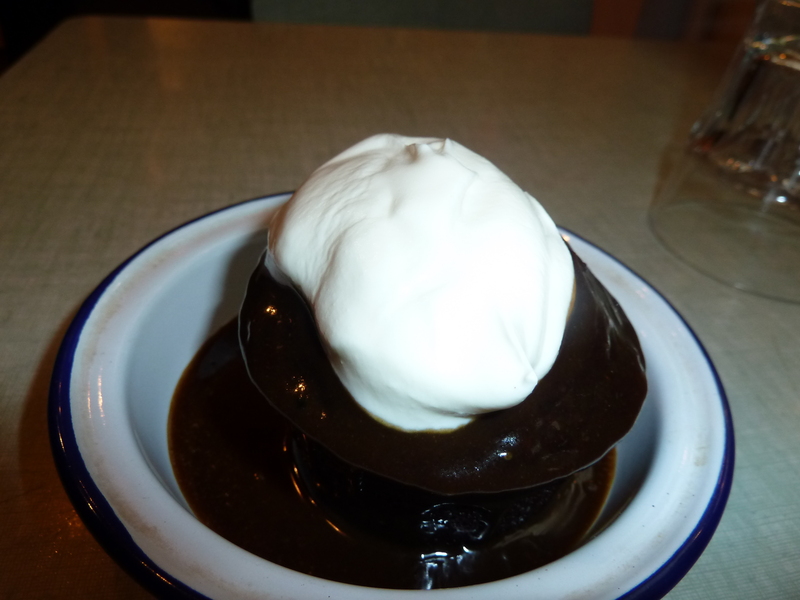 By contrast, my friend took a ginger sticky toffee pudding, which went down a storm and was very popular, judging by its invasion of other customers’ tables. 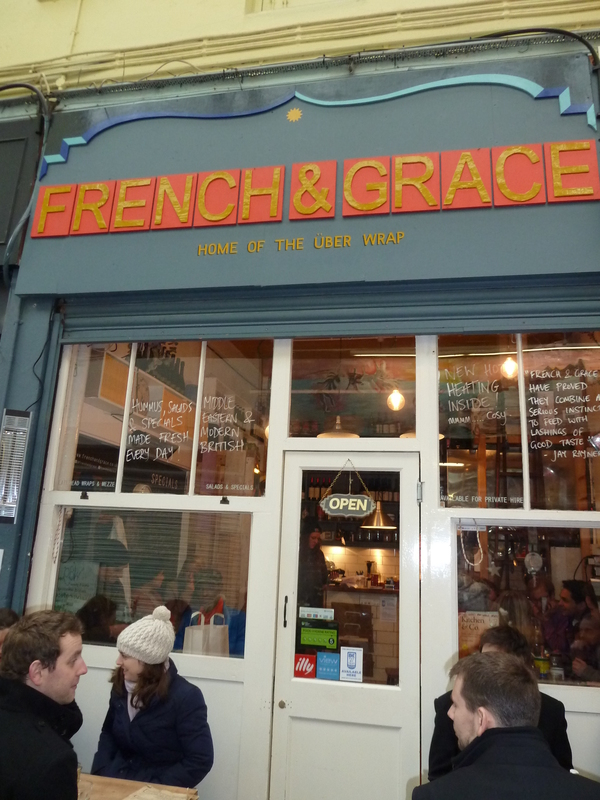 French & Grace 4/5 – I’m mainly basing this on the über-wrap, but I was impressed by the thoughtfulness that had gone into the flavours and, of course, its successful execution. Delish! When: Mon 12 – 5pm, Tues – Wed 12 – 11pm, Thurs 12 – 11.30pm, Fri – Sat 11am – 11.30pm, Sun 12pm – 10pm. If Brixton is a little too far south for you, French & Grace are currently fundraising to open a hatch in Camden – and they’re offering rewards for those who give, including free über-wraps. Details here. 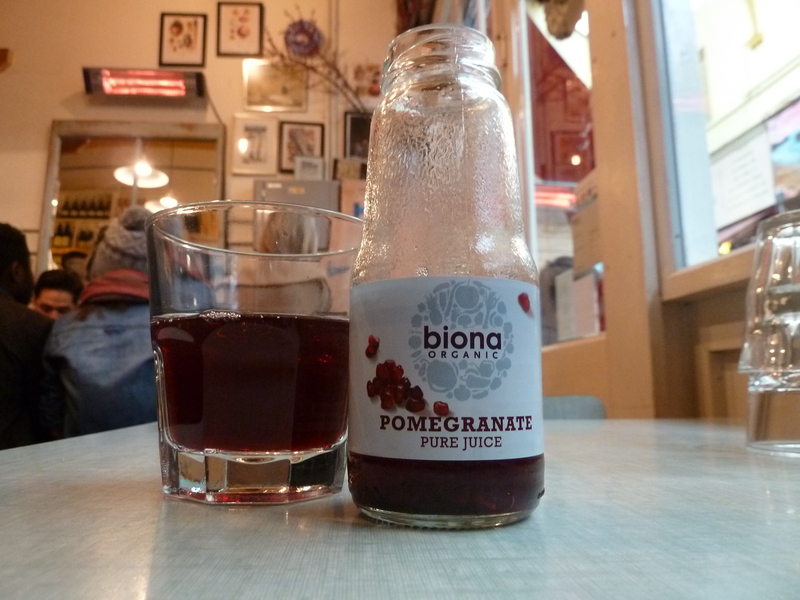 More pomegranate! Syrupy – not my cup of tea….